Meditatively learn to use the harder parts inside your body as needles and the softer parts as yarn and knit 3D sculptures inside yourself. As you get closer and closer to the harder parts the softer parts will create infinitely intricate mathematical structures at the interface. Use the notches between your tendons as needles and the softer tissue as yarn. This way you can work out the way your tendon structure has been impacted over the years. My tendon structure was totally tangled up. I untangle myself from the inside out. You just bunch up the soft stuff and skewer it with the hard stuff. And you are using only your sense of touch. 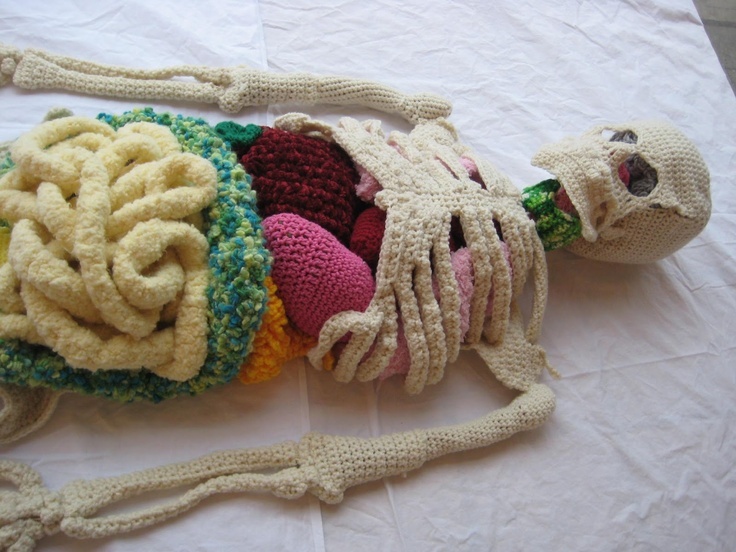 Why not just swallow two knitting needles then once your stomach muscles have learned how to use them, you can begin ingesting wool and commence knitting your own shroud. We preferred the "voice fry" idea, even though we have no idea what it means. //Why, why, why?// You know artists love to make a physical reality of abstract, esoteric ideas. [JesusHC] The scale of your idea doesn't work. Knitting in itself is quite a defined scale. Squeezing, manipulation of the body, for various reasons, is well known but I don't think it touches the scale your thinking about. Jesus just needs more degrees of freedom. We just don't have that. However -- it is Jesus. So he could have as many degrees as he needs, to stitch whatever tendons at whatever scale. I like this idea, but as it is not achievable by me personally, I no longer like it; I just feel jealous that I can never be untangled. jesus, I just saw that link maxwell - my god. He has access to all the degrees of freedom his father has. Palpation with Reiki has been thought of. Whether it can be factualised is another matter. In sematics, knitting can mean anything. Where do we, as meat sacks, use it in reality? If you stretch out you can feel the network of your nervous system connection by connetion, it is like a big stuck up net that is folded up in the extremities of the ways you moved in your life. So you can knit with this net, using the net which is not going to break as the hard part and your water bag as the soft part. Rolls of the individual neuron connection act like carbon fiber as chains around which you can fold stuff and store energy. Wouldn't the neurons grow along the lines of natural energy flows? The natural scaffolds, or extracellular matrix would be the stuff hard to knit, form or sculpture. If extruding a new limb was possible, probably the field/energy comes first and then the structure is knitted in, folowed by cellular population. Now, you see, that is what is wrong with the world. What on earth is a "natural energy flow"? Are we talking about thermal energy? Kinetic? Electromagnetic? And what is the rate of flow? How many watts must these "natural" channels carry? And what would be an "unnatural energy flow"? If all the forms of "energy" identified by the tombollockrists of this world could be properly investigated, we might be able to solve the world's energy shortage, if there were one. //Tombollockrist// I'll add it to my collection of names. The list only really has all the common ones . Imagine it and then test it. If the imaging isn't done, the looking isn't done. And waiting around to trip over something new at these new scales will be scarily long. The unfolding energy patterns of a developing embryo from a blastocyst feels to me like evolution had an energy run of some sort to scaffold off of to produce the level of complexity that it has. There you go again. Of course a blastocyt uses energy. It comes from the oxidation of glucose and other chemical reactions. Evolution is the inevitable consequence of random mutations coupled with selection for the fittest individuals. Embryogenesis involves cells both producing and responding to chemical signals. The parts fit together sufficiently tightly that there is no room for woo-woo. This idea make sense if you comb first. You have to comb it out by dancing. Comb it like wool. Use one mylinal strand or whatever they are to carve patterns through the coralification around the bones. //sufficiently//Because life, for some reason, needs degrees of freedom. Out of interest, [MB], what's your opinion of Koestler's "Ghost in the Machine"? Somehow, this is the most sensical [JHC] idea I've seen posted in the last two years or so.